It is said that breakfast is the most important meal of the day, and whether that is a true dietary fact or not, the Dubai breakfast experience is something that should not be missed. The city has lots of well-known places and some hidden gems that are definitely worth checking out. Here are our picks to the most delish places, where you can have the best breakfast experience; a fresh start for a new day. With a wide array of dishes ranging from acai bowls to the signature Long Island breakfast, The Hamptons is one of Dubai’s leading breakfast caterers. The café-style breakfast joint has three branches in Dubai alone; Jumeirah Beach Road branch, Jumeirah Island branch, and Arabian Ranches branch. Breakfast at The Hamptons is one of those things a true foodie would appreciate. However, to truly enjoy it, you will have to go early because the place is usually packed, especially on the weekends. In the heart of Downtown Dubai, the southern cooking-inspired New York restaurant has opened its first branch in the UAE, and subsequently the Arab world. 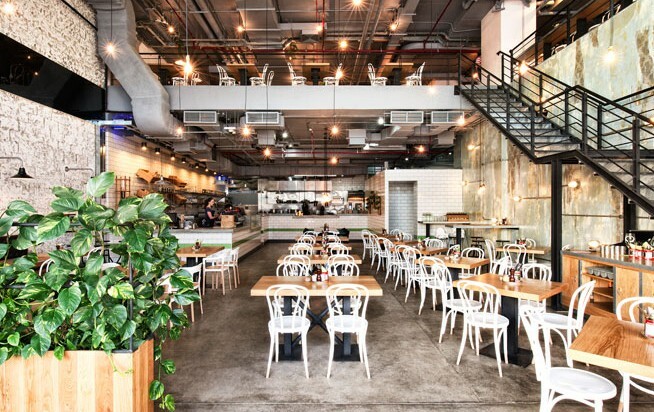 Clinton St Baking Co. is well-known in Dubai for its fried chicken and waffles, but it’s also great if you are in the mood and would like to try something lighter such as shell crab benedict, avo toast, and Huevos ranchors. The place is super cosy and welcoming, and therefore, it is one of the most perfect places for a breakfast date that is fulfilling as much as it is romantic. Tired of typical breakfast options? Then Tom & Serg café is the place to go. Every day, Dubai’s most beloved breakfast joint offers its customers classical dishes with a twist that is sure to satisfy your taste buds. There, you can enjoy avo toast topped with layers of tomato, lemon oil, zaatar, and mint, which is served with fried eggs with pumpkin seeds and granola made with cashew milk and coconut yogurt. With an unparalleled view of Dubai’s marina, the British eatery, The Scene, has made itself quite famous with their unmatched daily breakfast menu. Start your day with short rib eggs or the egg florentine, but if you would prefer something lighter, their granola and banana bread are out of this world. Well, as its name suggests, Eggspectation is one of those restaurants which specializes at perfecting one dish, in this case; eggs. The breakfast joint probably has the best eggs in town. But that does not mean they lack other varieties, as their heartwarming French toast, wide array crepes, and fluffy supersized stacks of pancakes come in handy. Eggspectation’s branch at JBR was so popular that they opened a new branch at City Walk. At JBR though, the view of the beach is something out of the dreams. An upscale, Parisian-style restaurant, La Serre specializes in Mediterranean breakfasts and light meals. A variety of options are on the menu, but one of the unique dishes you won’t find anywhere else is the Greek yogurt with nuts and Persian honey that will set you up for the rest of the day. If you’re looking for a heartier meal, try their scrambled eggs with truffle oil served on a crisp, buttery toast. 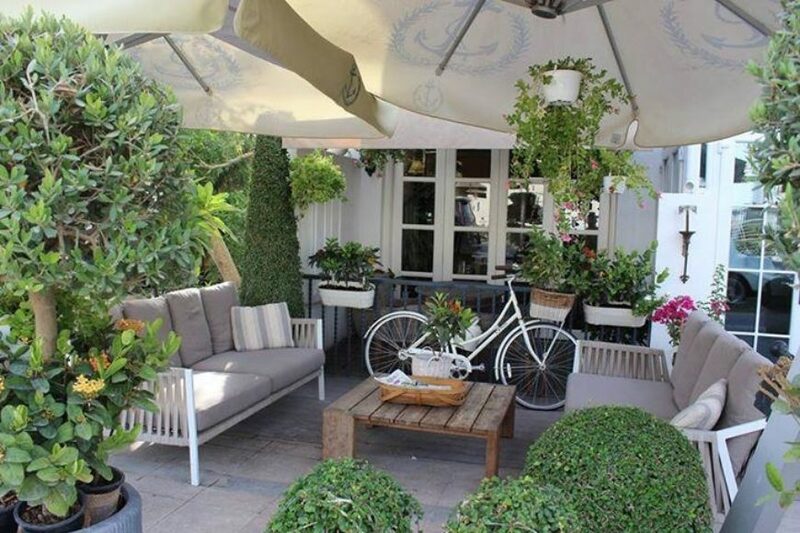 One of the oldest breakfast destinations in Dubai, The Lime Tree Café is home to their infamous Banana pancakes; indeed, the breakfast dish is fairly common. 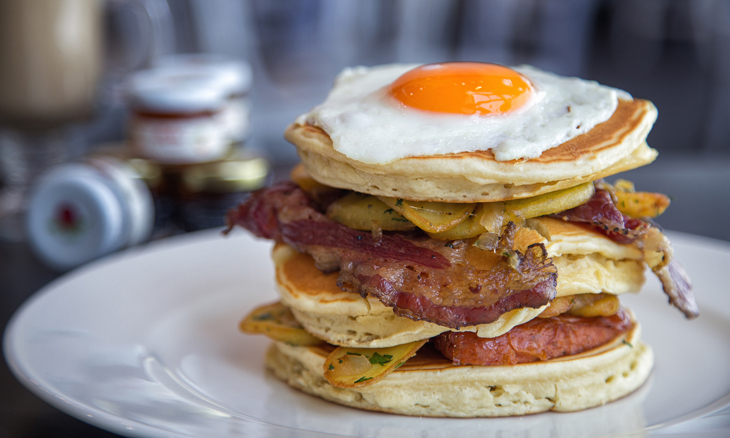 But what makes the Lime Tree’s version surpass is its fluffy American-style pancakes are served in heaped stacks with caramel-drenched banana and a generous pouring of maple syrup; a must-try dish! In for some oriental Lebanese breakfast? Sheikh Zayed Road’s Zaroob offers a traditional Middle Eastern breakfast with beans served in steel jars mixed with tahin, olive oil, parsley, onions, and tomatoes. It is also home to the most delicious fateer in Dubai; experience self-indulgence at its most while eating their fateer with Kraft cheese and honey. 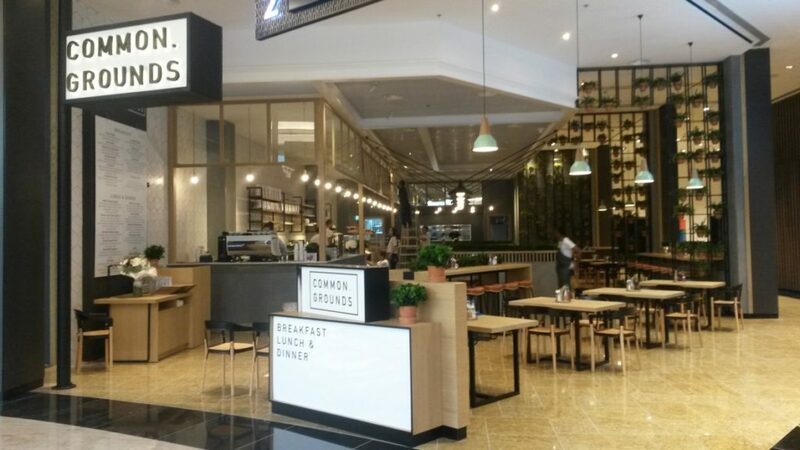 Common Grounds is one of the newest, yet most visited eateries in Dubai, and for that, we have to thank the team behind Tom & Serg for bringing Common Grounds to Dubai. Despite the long wait for either the table or food, the experience is worth it. The food is tasty and wholesome with a spacious area allowing you to chill and kick back after a round of shopping at the Mall of the Emirates. Once again, the dynamic duo behind Tom & Serg and Common Grounds have ventured into yet another eatery. The Sum of Us has one of the most beautiful interior designs in all of Dubai with a modern, chic look. The menu is short and to the point with a signature pie of the day, burgers, salads, and other globally-inspired dishes. 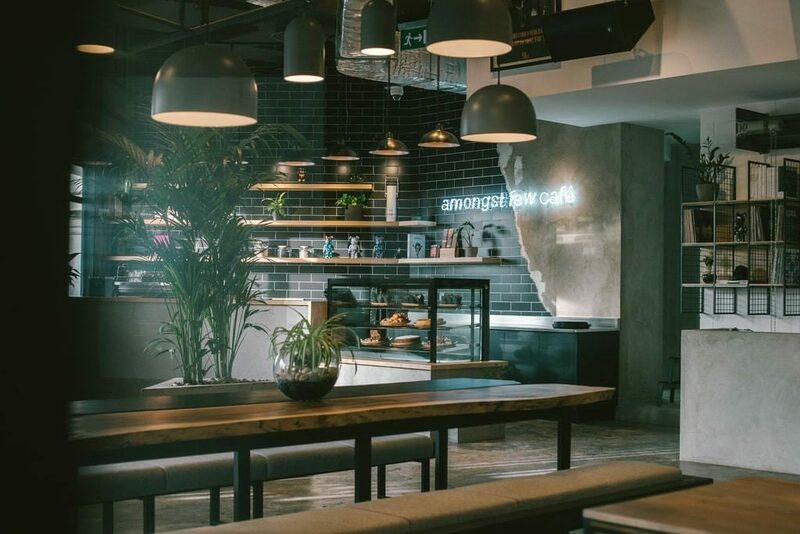 The Emirati street-wear brand Amongst Few has ventured into the restaurant business and introduced a café that has the same name. Amongst Few has an array of savory breakfast dishes that are finger-licking good. 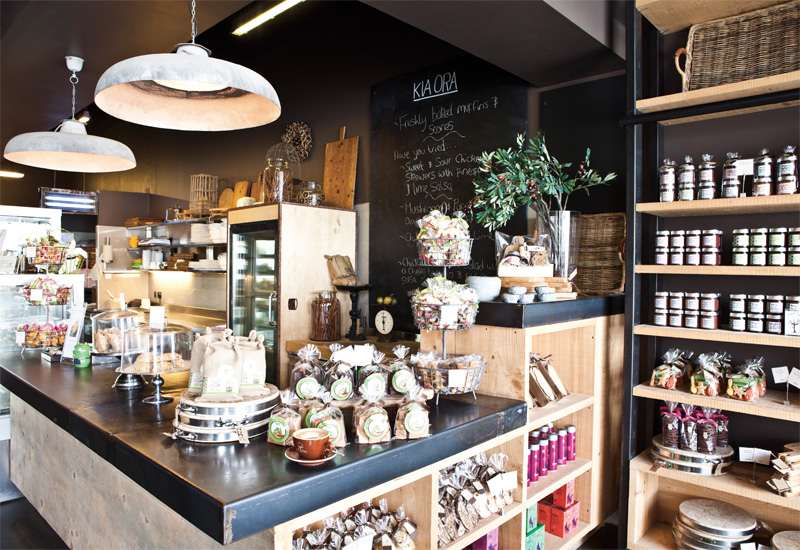 Their breakfast combo of avo and eggs on sourdough followed by their iconic coffee is one way to start your day. Once you step foot in Comptoir 102, you immediately leave the bustling, ever-so-loud city and enter into a peaceful, heartwarming setting; the café with a garden serves organic, vegan, and gluten-free options. The menu is changed regularly with healthier options added each time. Also, they have the best smoothies in Dubai! All of this comes in a beautifully designed space connected to a concept decor and clothing store. With all the ruckus of Dubai taking place downtown, little breakfast joints can be found on Jumeirah beach road. The eatery is found just past the Jumeirah Beach Hotel next to the Surf House Dubai; a very convenient setting. The breakfast menu there is filled with options to choose from, but the hidden gem there is the signature Acai Bowl; a savory collection of organic Acai berries, guarana berry with sliced banana and homemade granola served with refreshing orange juice. Although the restaurant hails from London, the food is all French. And since boulangeries are perhaps the most defining feature of French cuisine, Aubaine is the home to the best croissants in the Emirates. They are made with old French methods without the use of any additives or preservatives. So, if you are in the mood for a Parisian street-side breakfast and craving almond croissants, you know the place to go.